This wet weather we’ve been having in Melbourne town has been the perfect excuse to stay at home for some indoor activities. I was the kid at primary school who was more than happy to be confined to the classroom at lunchtime when things got wet. How sad?! Some knitting got done today and I completed Sharon’s stripy socks (for me). 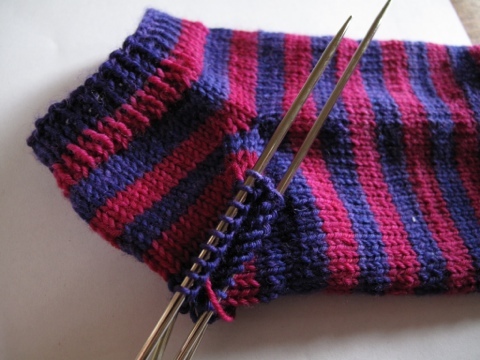 I loved learning how to do the afterthought heel (it’s just another toe!) brilliant! I took some progress photos of the transformation. I am super happy with how they’ve turned out and they’re a great fit. 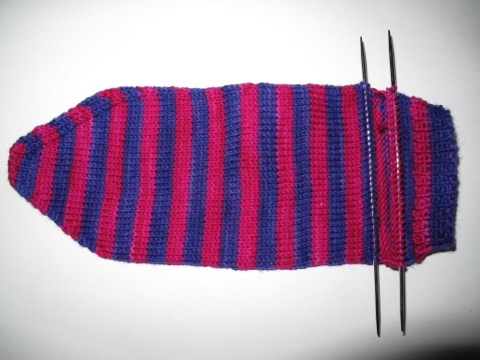 If you plan to knit this one, I would recommend using a variegated yarn such as Noro to disguise the double stripe that you get when adding in the afterthought heel. If I made it again, I’d also add in more rows for the leg, I get cold ankles.